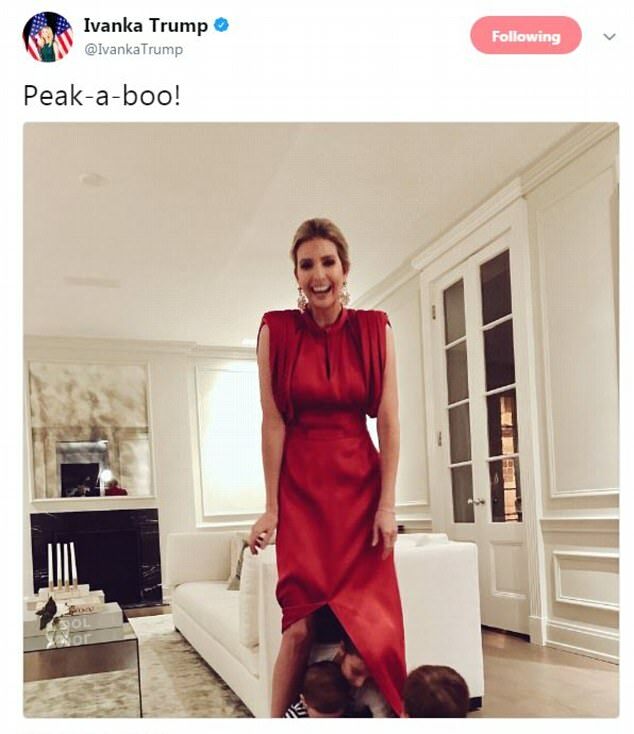 The 36-year-old first daughter may have thought she was just posting a few cute snapshots of herself playing with her kids on Tuesday evening, but many Twitter users slammed her for letting her children play under her dress. 'Or is it a dig about men hiding behind their momma's skirts? 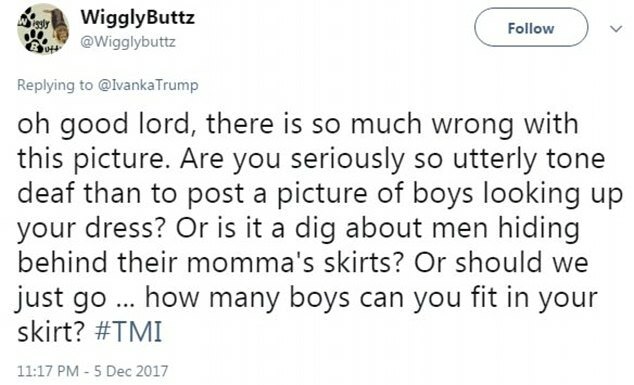 Or should we just go ... how many boys can you fit in your skirt? #TMI,' the person added. 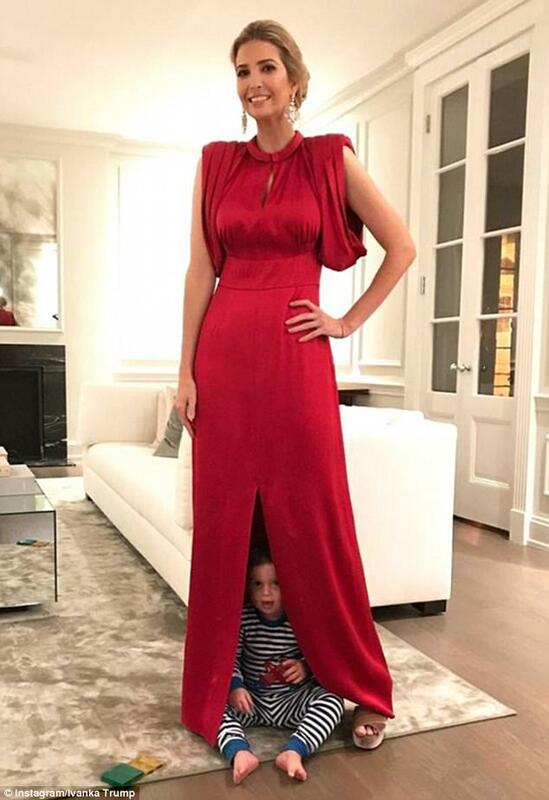 Ivanka took to Twitter yesterday evening to post an image of her children - Arabella, six, Joseph, four, and Theodore, one - attempting to hide under her flawless red, floor-length gown. The fashion mogul shared a similar image to her Instagram page showing an adorable Theodore sitting on the ground at her feet while in his pajamas in the family's living room. Cassandra Paige responded by noting that Ivanka is highly educated and attended the Chapin School, an elite all-girls school in Manhattan, and Choate Rosemary Hall, a famous boarding school in Connecticut. 'Except she went to expensive private school. I went to public school and I know the difference between peak and peek,' she wrote. 'Is this how the Trumps play? And you think this is normal?' Donna Connelly asked. 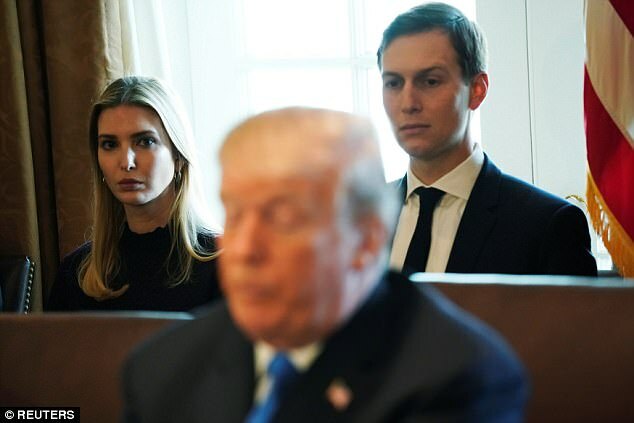 Ivanka's husband, Jared Kushner, was also slammed in the comments section, with many insisting that he was headed to jail. President Trump's son-in-law was thrown into the heart of special counsel Robert Mueller's probe after being implicated as the official who told Michael Flynn to contact Russian officials on behalf of the White House. Interestingly enough, a few people saw the photos and immediately thought of a scene from A Christmas Carol, Charles Dickens' classic holiday tale about the dangers of greed and selfishness. People presumably pictured President Trump as miserly Ebenezer Scrooge when they compared Ivanka to the Ghost of Christmas Present. 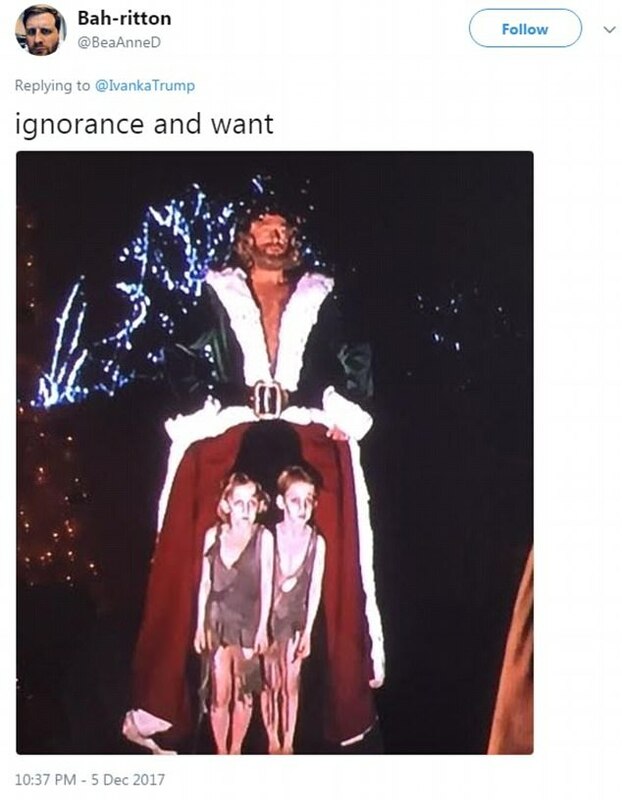 During Scrooge's visit with the Ghost of Christmas Present, he lifts up his robes to show two emaciated children named Ignorance and Want. The Ghost of Christmas Present mocks Scrooge's sudden concern for the children when he never cared before. 'Are you the Ghost of Christmas Present?' 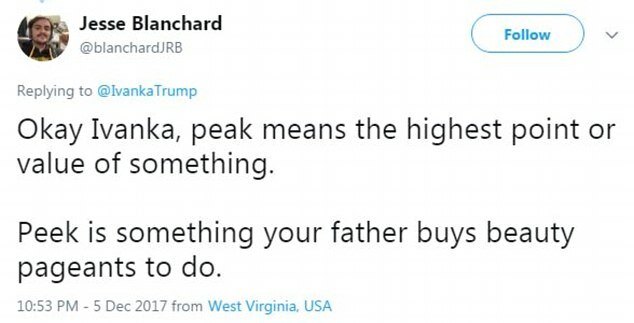 one Twitter user asked Ivanka. Of course, some fans of the first daughter thought the pictures were 'sweet' and advised her to ignore her critics. 'Nothing is wrong... You done well mam,' Mohit Maurya commented. 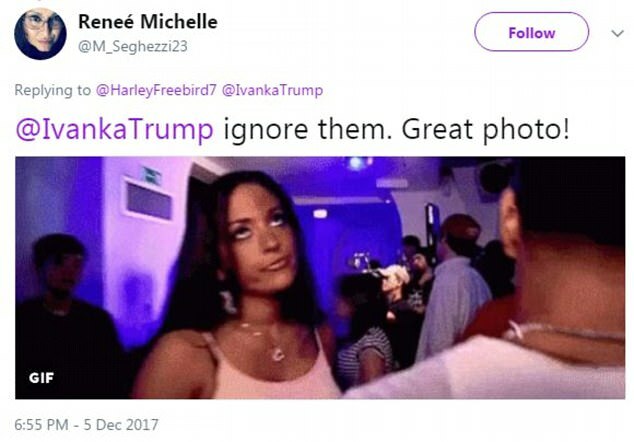 Ivanka has yet to comment on the criticism, nor has she removed the controversial photos from her Twitter and Instagram accounts. She was back to work on Wednesday to watch her father talk to reporters before a cabinet meeting at the White House. The White House senior adviser was photographed sitting between White House chief economic adviser Gary Cohn and her husband Jared. 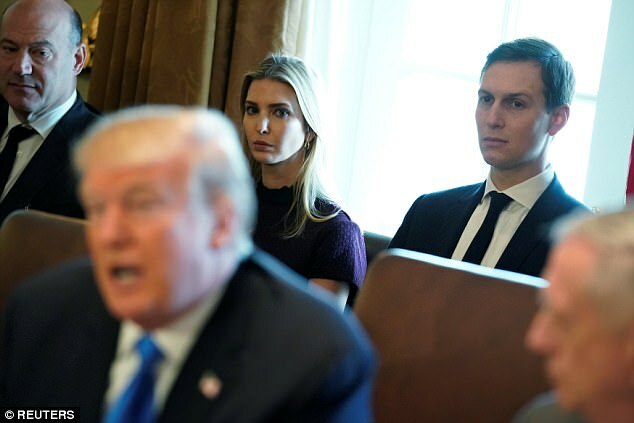 Both Ivanka and Jared has serious looks on their faces as they sat behind the president ahead of the meeting.